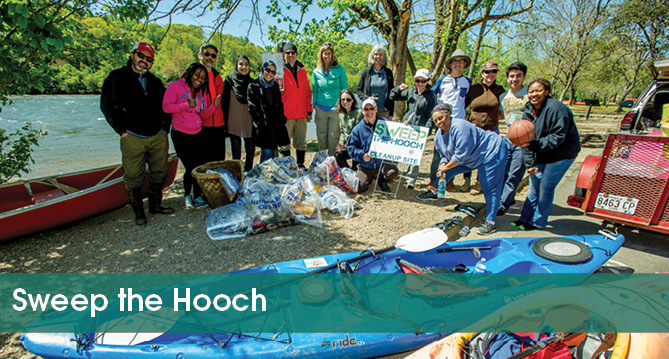 Back for the 8th year, Sweep the Hooch is an annual day of service to the Chattahoochee River watershed mobilizing volunteers on foot, in waders, or kayak/canoe paddlers to remove trash at locations throughout the watershed. Sweep the Hooch brings people together to give back to the mighty river that gives us so much. Together we have removed more than 57 TONS of trash with the assistance of more than 3,500 volunteers. 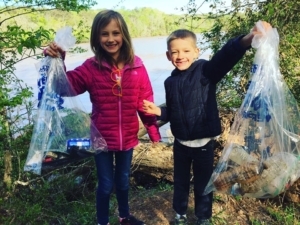 This year, we will organize and supply more than 40 cleanup locations throughout 100 river and tributary miles – from the headwaters above Lake Lanier, through the Chattahoochee River National Recreation Area and Atlanta, and down to West Point Lake. Volunteers can choose to be Walkers, Waders, and Paddlers. Each site has a capacity and will close once we reach that capacity – so register early! CRK provides gloves, trash bags, trash removal and recycling (where available), restroom facilities, and team lead support. WALKERS are land-based volunteers who will pick up trash and perform trail maintenance. At some sites, walkers will specifically target invasive non-native vegetation (such as privet). WADERS are volunteers equipped with waders or wading boots and are needed at select sites. These volunteers will collect trash from the shallow water areas, and from areas on the river bank that are accessed most easily from the river and streamside trails. Volunteers must provide their own waders. PADDLERS will utilize kayaks/canoes/SUPs and travel between 3-5 miles per segment. These crafts are useful in collecting debris from portions of the river that cannot be accessed from the land side. Volunteers must provide their own kayaks and/or canoes. Boats are not available on-site. Need to rent? Click here to view a list of local outfitters. TEAMS. We welcome teams, but all volunteers must register individually. During the registration process, you can enter your Team Name. Child/Youth Participation: We welcome children, but they must be supervised at all times by an adult. Although a cleanup is not normally dangerous, it can be to an unattended child. Walkers/Waders: Must be at least 10 years old. Paddlers: If paddling solo, paddler must be at least 15 years old. If paddling tandem, youth must be at least 10 years old and accompanied by an adult at least 21 years old. Each participant is required to sign the CRK Liability Waiver. Click here to read the CRK Liability Waiver. This form will be authorized as an electronic signature during the registration process. 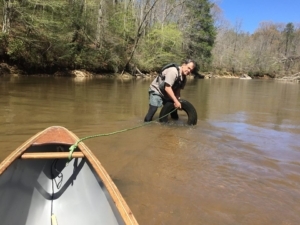 Sweep the Hooch is organized in partnership with the National Park Service and Upper Chattahoochee Chapter of Trout Unlimited. BECOME A SPONSOR! If you are interested in sponsoring this event in support of CRK and our fight for clean, safe water, please view our sponsor packet — or contact Becca Klein. Sponsor deadline for Sweep the Hooch is March 23, 2018. Thank you to all the parks, associations and advocacy groups for hosting cleanup sites!